Maybe it's just my impatience, but this BioShock Infinite download seems to be going very slowly. Then again, I've already waited over two and a half years for this game, so I suppose another hour isn't such a big deal. Just about a year ago, I wrote a similar article about Journey, another high-profile game that was years in the making. It was nice to take a few minutes to reflect on the long development and preview cycle, so I thought I'd write out a few of my final pre-game thoughts. I'm having a hard time coming up with another game that has had more pre-release coverage. From a cynical perspective, I'm impressed by how Irrational and 2K have used the gaming press as an incredibly strong arm of their marketing campaign. For years now, BioShock Infinite has been the subject of magazine covers, developer interviews, and video previews. We got articles about Elizabeth's great AI and Columbia's magnificent skyline before the game was ever out. More optimistically, it was refreshing to forgo a lot of the inane secrecy that surrounds most games. In an environment where gun models are locked behind NDAs, the idea that we got so much insight into the game was novel. 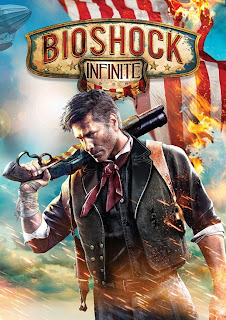 All in all, I hope more companies emulate BioShock Infinite's marketing campaign. Hearing about the challenges of designing intelligent AI or listening to Ken Levine talk about the game's cultural allusions is far more interesting than a series of jump cut-heavy accompanied by dub step. True, the final months have seen quite a few large billboards and promotional videos, but it was nice to have the conversation leading up to the game revolve around the craft of game-making rather than wild speculation. For those of us in the critical bubble, this kind of huge marketing blitz is unnecessary: of course we'll be buying it. But the reality is that BioShock doesn't have the broad cultural cache Call of Duty, Super Mario or Angry Birds. It took years for the original game to hit the 4 million mark, a number that's nothing to sneeze at, but is still lower than many other marquee titles. With Infinite 2K is clearly hoping that it's critical prestige is accompanied by equally sterling sales numbers. Alright, that percentage is getting close, so one final thought: regardless of how the game turns out, it's been a pleasure following Ken Levine as he becomes a kind of elder statesmen of the medium. Hearing someone who is so candid about his successes and failures talk about not only his game, but the craft of making games in general is really valuable. After watching his latest interview with Giant Bomb, I'll be interested to see what he does next. Making the kinds of games he makes takes a long time, so who knows how many more we'll get. Well, it's all loaded up now! See you on the other side.